The Largest and Richest Collection of 17th Century Shipwreck and Pirate Artifacts in the Whole World! Seafaring adventurers have always intrigued human culture with their willingness to brave the unknown and venture into the unpredictable waters of the world for exploration, fishing, commerce, and sometimes high seas piracy. Join our expert guides for an intriguing journey back in time to learn all about the storied history of seafaring in the Keys, the Caribbean, and the world. Key West, Florida, because of its proximity to three vital bodies of water for the Americas (the Atlantic Ocean, the Caribbean Sea, and the Gulf of Mexico) has played a vital role in maritime activities. You can witness firsthand the biggest and most valuable collection of Seventeenth Century shipwreck and buccaneer artifacts on the planet. You can view the tangible evidence why pirate scallywags risked life and limb to pillage mercantile vessels: real bars of gold and silver. 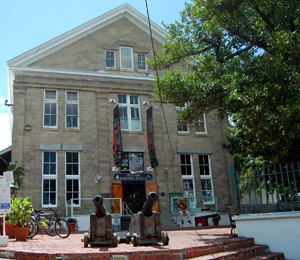 The Mel Fisher Maritime Museum is the only facility in Key West to see the wide array of authentic artifacts. This museum is home to more than twenty million dollars worth of historic artifacts and valuable treasure, including an array of weaponry, finely crafted jewelry, and other treasures. You can see a golden cross inlayed with the best emeralds on the globe. You can see pottery utilized to carry food and water on long sea voyages. You will see authentic firearms, swords, and knives used by pirates and privateers in marine battles. You will learn all about seafaring explorers in one of the museums many exhibits, including the highly popular Age of Discovery exhibit. You will be fascinated by presentations on the most famous vessels of the Seventeenth Century. I have been to the Bahamas many times, but Mel Fisher Maritime Museum is one of my favorite trips! It includes everything that everyone should do here. As a Bahamas veteran, I can say only the best about this experience!